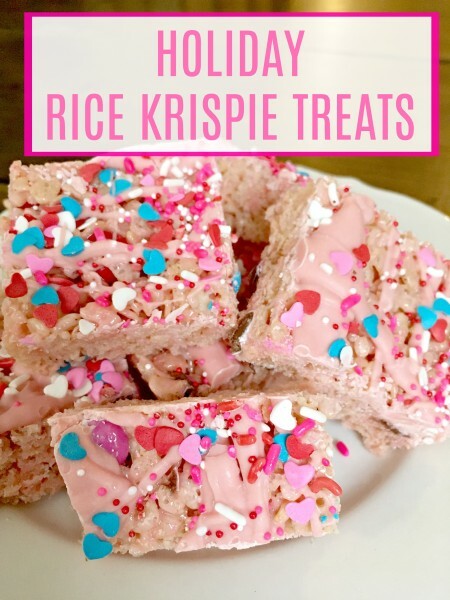 One nice thing you could do for those you love is whip them up some Rice Krispie Treats! We have a friend with an egg allergy and so when planning to take them dinner last week, I knew these would be a perfect & safe dessert. 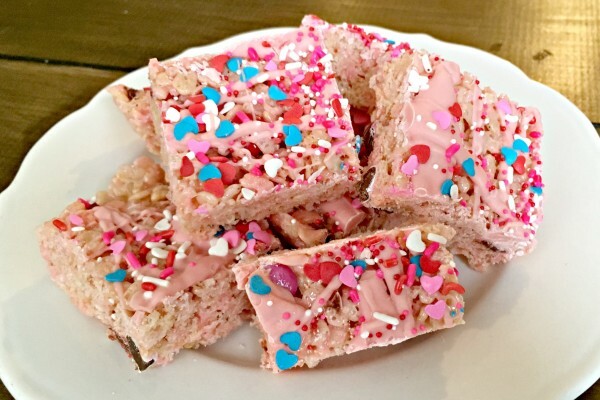 It’s your basic Rice Krispie treats with a whole lot of extra goodness. A fun holiday spin on a classic dessert! Melt butter in a large sauce pan over medium heat. Add in marshmallows and stir constantly until melted. These can be customized for any occasion! Just mix up the food coloring, candy melts & sprinkles to match the holiday you are celebrating. I found my candy melts at Hobby Lobby, however you can also purchase them on Amazon. Target usually has great holiday sprinkles in their $1.00 section, and I also found some at Aldi this year. Last, I love this collection of food coloring. They have pretty much any color you would need. Not feeling Rice Krispies? 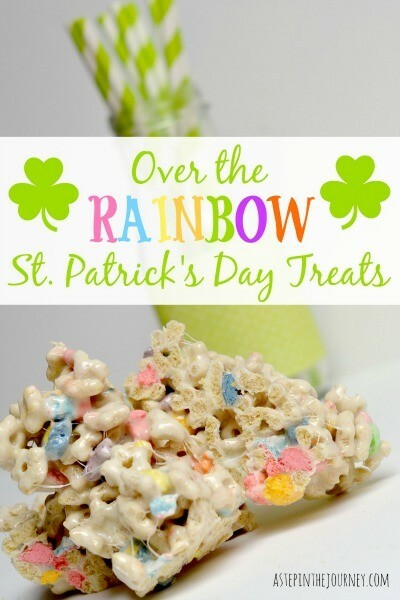 Check out these Lucky Charm treats I made for St. Patrick’s Day! this post contains affiliate links. thanks for helping me support my family. 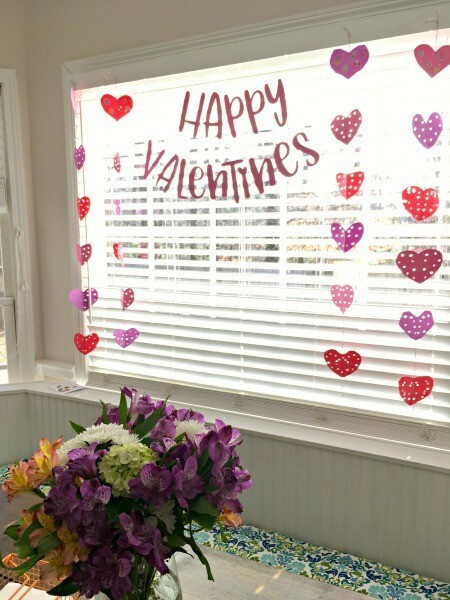 Decorating for Valentines Day is usually brief, but I like to do it anyway. We have a few banners up around the house and this one might be my favorite. 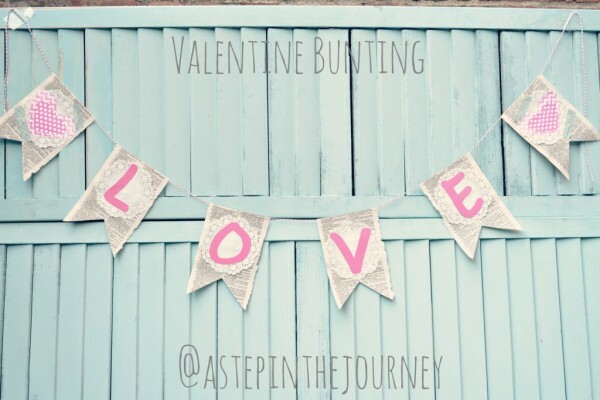 Some of the banners I use year after year like this Valentine bunting from forever ago. Other decorations I have had the kids help me make. 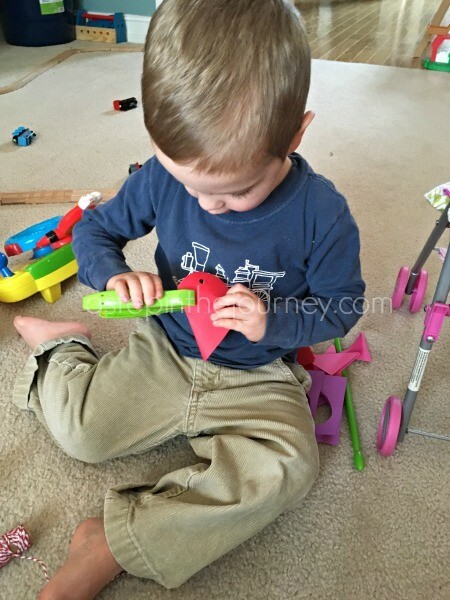 This Valentine activity was dual purpose. Not only was it a great fine motor skill activity for Chickadee and Sprout, it also added a little LOVE to our breakfast nook! It was really quite simple. All you will need is some colored paper, toddler scissors, a pen, hole punch and string. First I cut each piece of paper into 1/4ths. 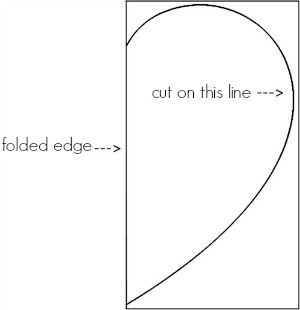 Then I folded the 1/4th in half and drew half a heart starting and ending on the fold. Chickadee was my first helper. She is 4 and cutting with scissors is great find motor skill practice for her. So she cut out all of the hearts. After she cut the hearts out, Sprout (2.5 years old) went to town with the hole punch. 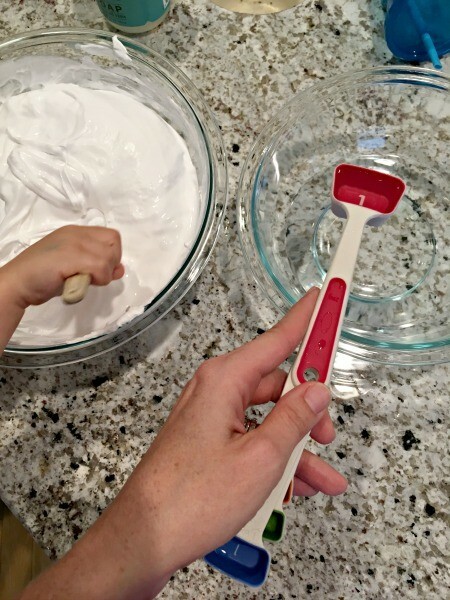 A hold punch is so much fun for kids and really great for strengthening their hand muscles. Last, I taped them onto string and hung them up in the breakfast nook. 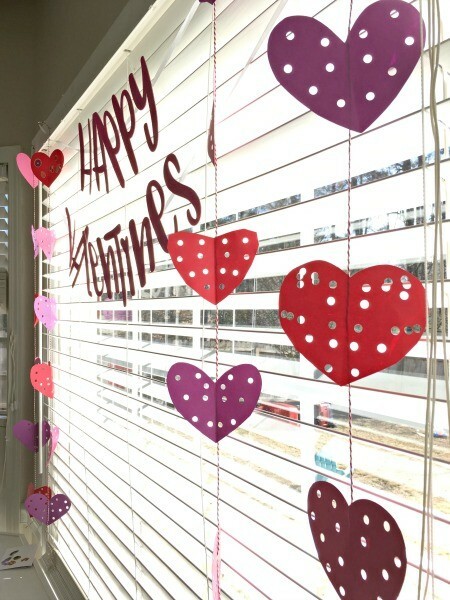 The Happy Valentines Bunting in the middle is from Target’s dollar section. It was $3 and is glittery so Chickadee especially loves it. However, you could easily make that yourself too. 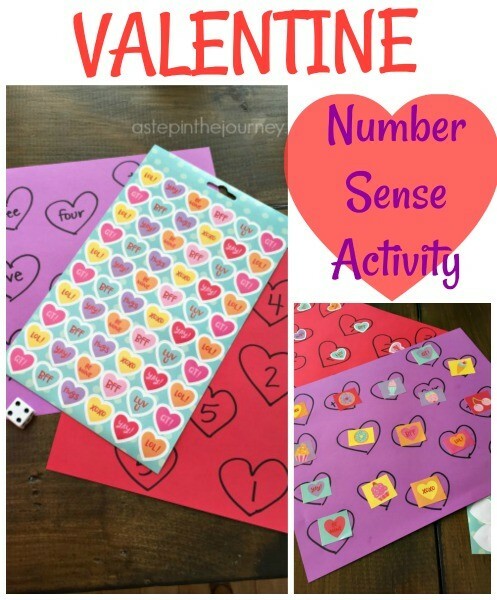 Just like the number sense activity I posted last week, this is a great activity for toddlers of many different ages. 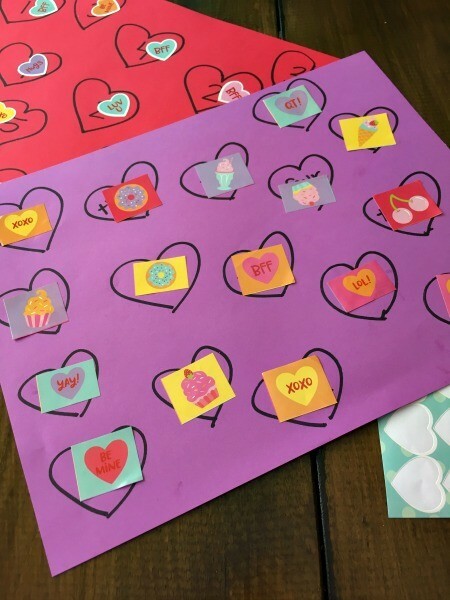 You could also make a template for your older child and they could trace the heart outline before cutting. So, do you decorate for Valentine’s Day? We will probably leave the hearts up for all of February and then change things our to Spring and Easter once March arrives. I sure hope March brings the sun and a little warmer temperatures! Valentine’s is in full swing over here! We have decorated, crafted, played and eaten our fair share of Valentine themed everything, and we still have a week to go. I know people say it gets all “Hallmarky” but you won’t find me pouting on folks wanting to celebrate LOVE. Let’s do it every day! And let’s do it in February! And let’s do it on the 14th! Spread the LOVE. The afternoons are the hardest time of day for me. As a stay at home mom it seems the three-ish hours from the end of nap time until when dad comes home are the longest. Especially, when it is cold and or raining. I try to think ahead and have some type of activity to do with the big kids and this always helps pass the time. 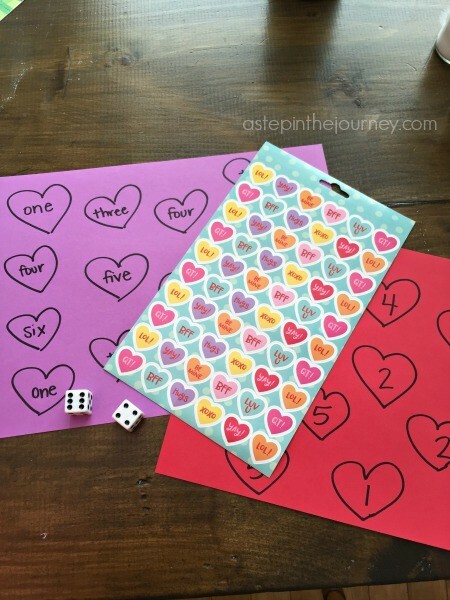 Seeing as we are doing all things hearts, the other day I threw together a fun heart and number sense activity. And you can too! All you need is some paper, a marker, dice & stickers. I changed things up a little bit between my four and two year old, but the game was played the same. 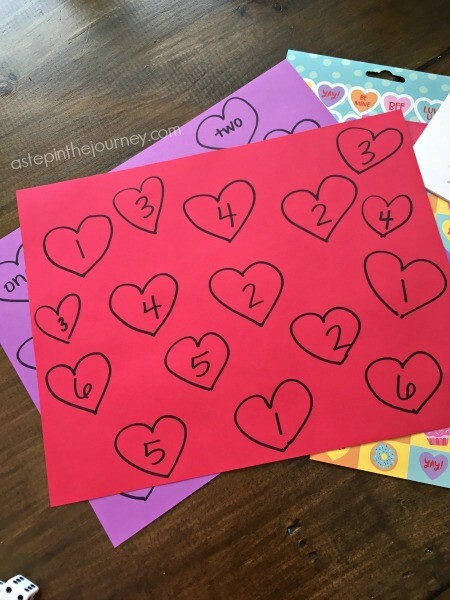 For my two year old I drew a bunch of hearts and wrote numbers 1 – 6 inside them. I wanted him to work on number sense, both recognizing digits and being able to do one – to – one correspondence counting the dots on the dice. For my four year old, we are working on reading. So, inside her hearts I wrote number words 1 – 6. I wanted her to work on reading the number words as well as recognizing the number of dots on the dice without having to count the dots. Here are what their papers looked like before we started. Then they took turns rolling the dice and placing stickers on their paper, covering up the number digit or word they rolled. I thought this activity might be one and done, but they both asked to play again. Chickadee immediately and Sprout after he played trains for a little while! 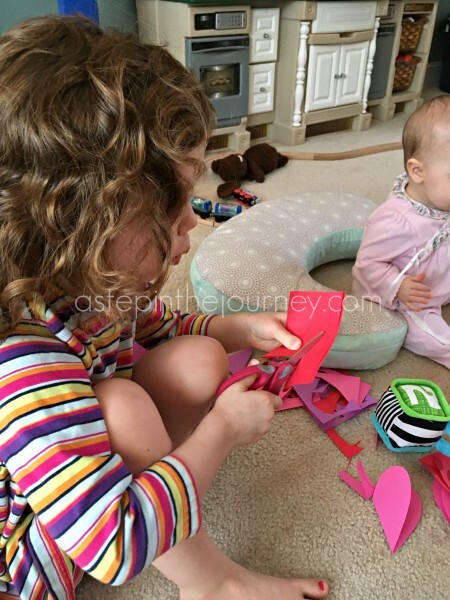 I love when activities can be fun for both of them and challenge them at their current ability levels! 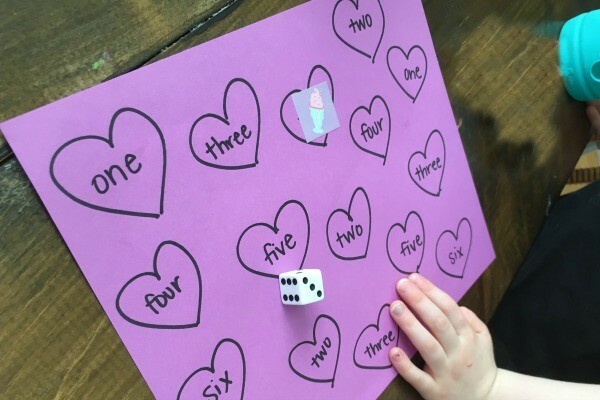 You could also extend this having your older kids roll two dice and adding them together. The numbers on the hearts could then be numbers 2 – 12! Oh sweet baby girl. We are soaking you in as much as we possibly can! You are the absolute sweetest baby and we are all smitten. 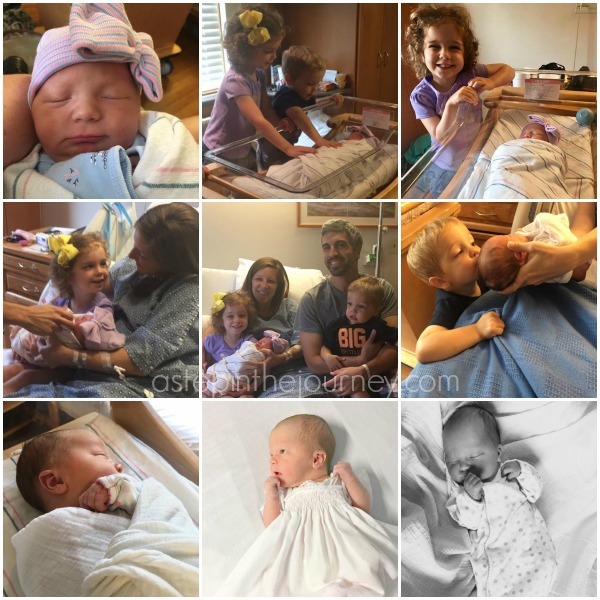 I can’t express how thankful we are that you made us a party of 5. You are so mellow and are happy to be along for the ride. You haven’t had a rough night since night two in the hospital which has made it easy to keep you in our room. Upstairs seems so far away, so we have kept you close. And I can count on my two hands the number of times we’ve had to bring you down from the crazy cry in these past three months. Your sister and brother smother you to pieces. They love holding you, giving you their toys, and making you smile. 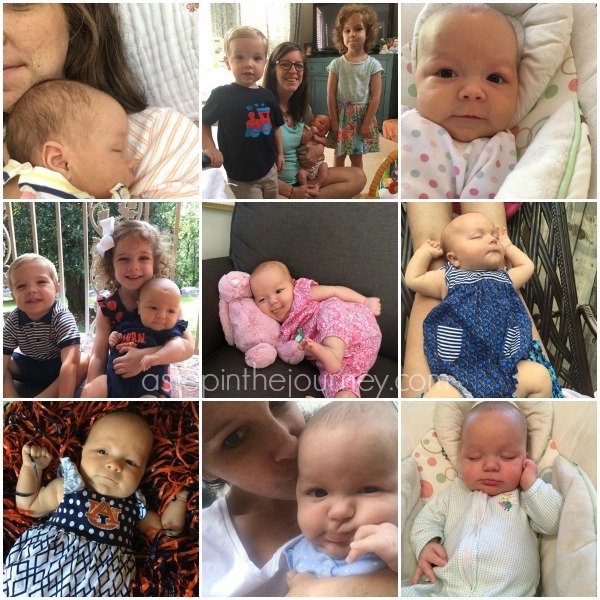 Basically, the last three months have been better than imagined! 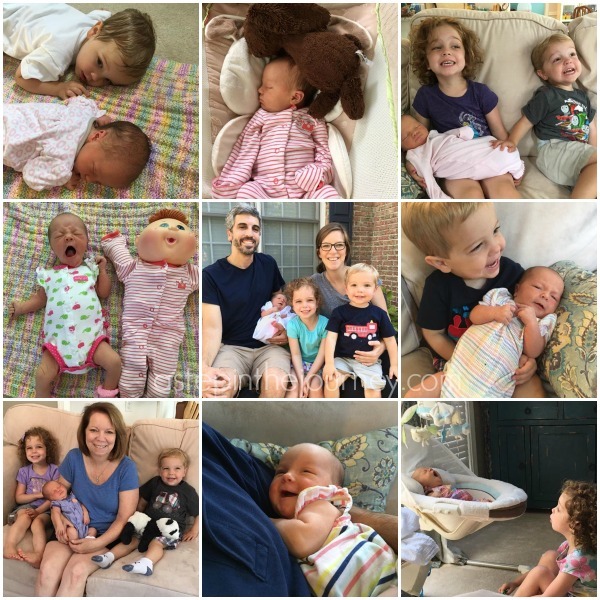 By the time you were six weeks old you were sleeping 5-6 hour stretches at night…I could fee you about 10:30 and you would make it to about 5:30, still a stretch, but some might call that sleeping through the night. By 8 weeks though you were sleeping 8 hours pretty consistently. 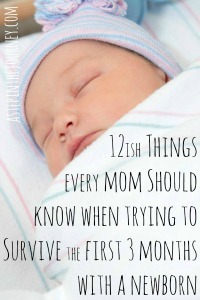 Mom had to adjust a little bit, but once she saw you had gained 4.5 pounds since you were born she knew sleeping through the night wasn’t hurting you at all. At your two month appointment you weighed 11lb 7oz and were 23.25 inches long! Growing like a weed. I feel around the two month mark was also when you started to really “look” at us and study our faces. 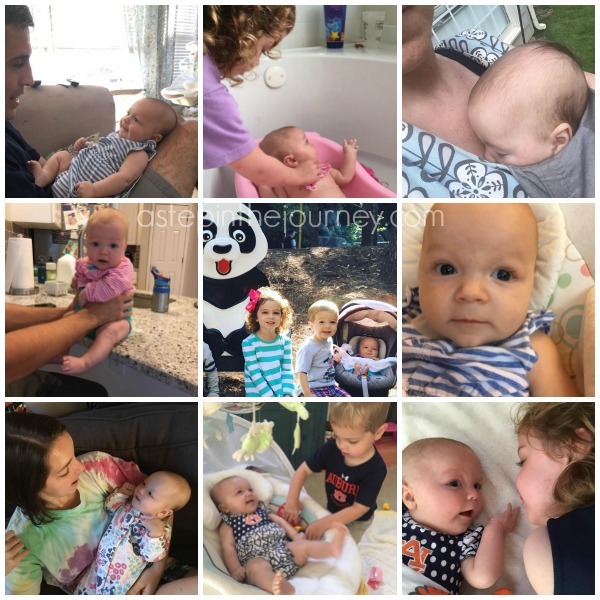 When you hear our voice you have started smiling and you have no idea what that does to a mama & daddy’s heart. If I knew how to type emojis I would give you all of the “heart eyes!” You began sucking on your fingers a lot to self soothe and I’ve been trying to get you to use a pacifier instead, you give in most of the time! You also rocked your first road trip over Labor Day. We went to Oneonta for the long weekend to visit Bebe & Pop. You were loved on by many and enjoyed lots of snuggles and a few lazy lake days. You can get used to those! And now sweet girl you are three months old. Goodness, where does the time go. Those newborn snuggles are hard to give up, but your HUGE smile is a pretty close substitute. You are quite chatty these days as well. Lots of babbling and cooing and smiling. 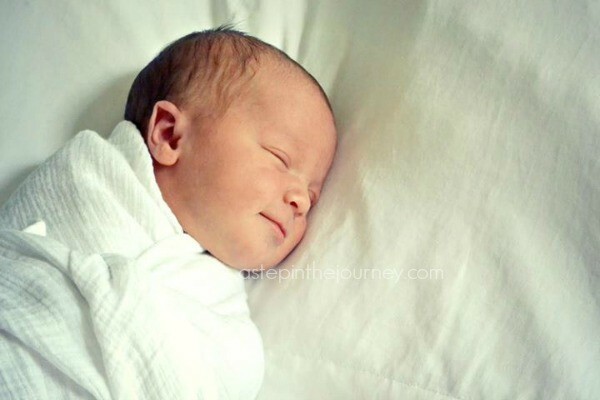 You are now sleeping about 10 hours at night pretty consistently and we have plans to move you up to your nursery soon. 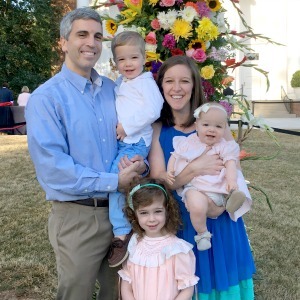 You took another road trip down to Fairhope, AL where all 5 of us bunked up in a hotel room at the Grand Hotel. You slept by the pool and got lots of compliments on how cute and chill you were. 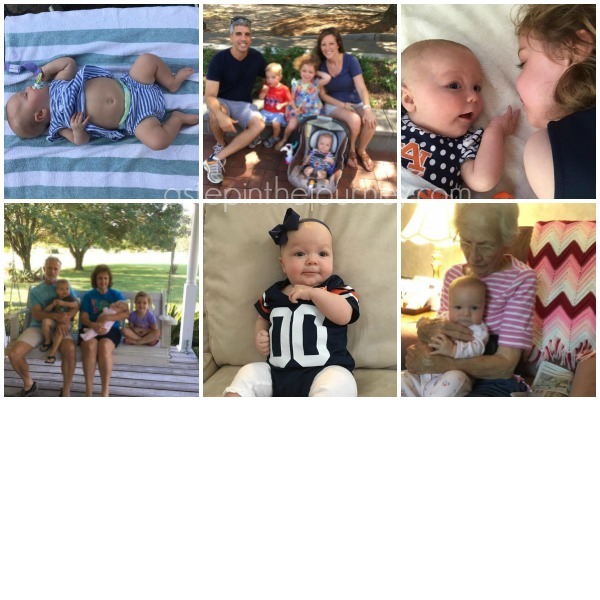 We then headed over to Bay Minette to visit with Nana & Paw Paw and also were able to spend a lot of time with your great grandmother, Nannie. You are a champ in the carseat and for that I am so grateful because we are on the go a good bit. You nap mostly in the swing and like watching the mobile. When you do get fussy you like being snuggled up next to me in the Ergo or laying in your daddy’s arms. We truly are all smitten with you. We are so grateful that God saw us fit to be your parents. You are a delight, pure joy sweet girl. As our family grew so did our hearts and we are thankful that our love continues to multiply. We love your fiercely Poppy and pray that you love others like Jesus, just as your namesakes do/did! How excited are you that is is OCTOBER?!!?! I would argue that it is one of the best months of the year, especially if that cool fall air has kicked in. Unfortunately, that is not the case here in Georgia. It is a nice balmy 82 degrees, the perfect weather for shorts and a tank top. We are hoping it will cool off my Halloween so we are sweating as we trick or treat this year! But aside from the weather woes, October is here and we are excited! 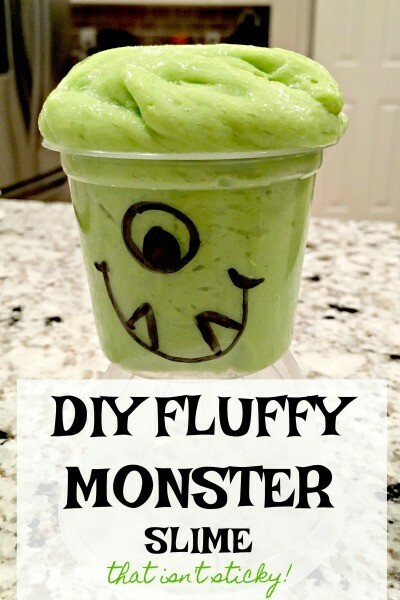 And one thing that has us all super excited is this DIY Fluffy Monster slime. It is awesome, isn’t sticky, and best of all, will entertain your little ones for HOURS! 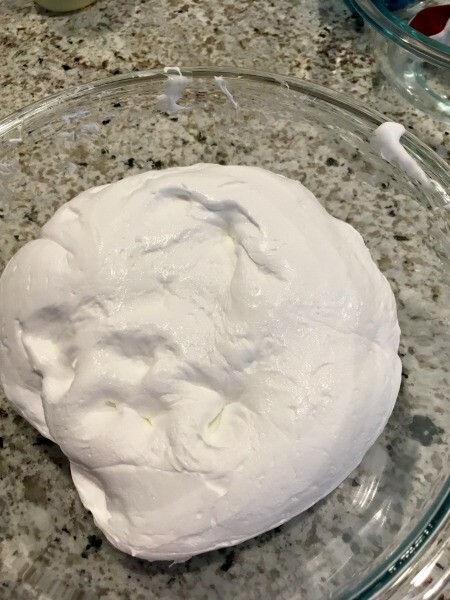 I have to thank my friend Caroline for sharing the recipe with me…I’d seen her girls playing with is on her Instastories feed and I knew we needed the recipe in our house PRONTO. Chickadee has been playing with it for days and it even pulled Sprout away from his trains for a little bit, which is quite the victory! We happened to have all the ingredients on hand, but if you don’t I bet your neighbor can help you out. Here is the step by step picture tutorial. I’ll leave the recipe at the bottom if you want to print it off and see everything at once. 1. 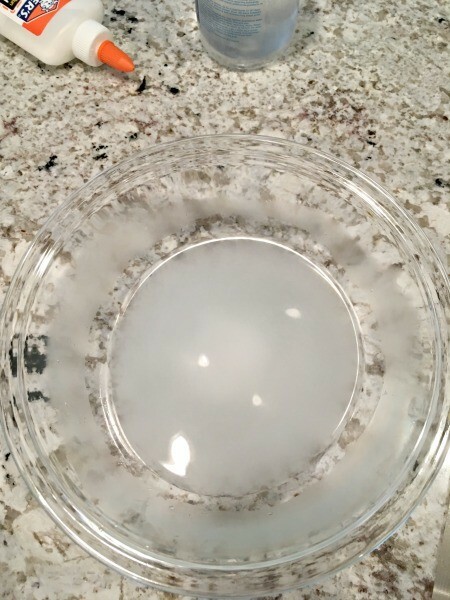 In a bowl mix together 1 tbsp of Borax with 1 cup of warm water. 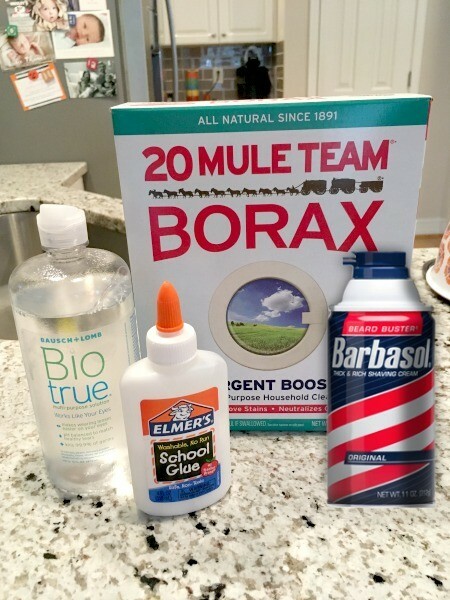 Stir until the Borax dissolves and your mixture turns clear again. 2. 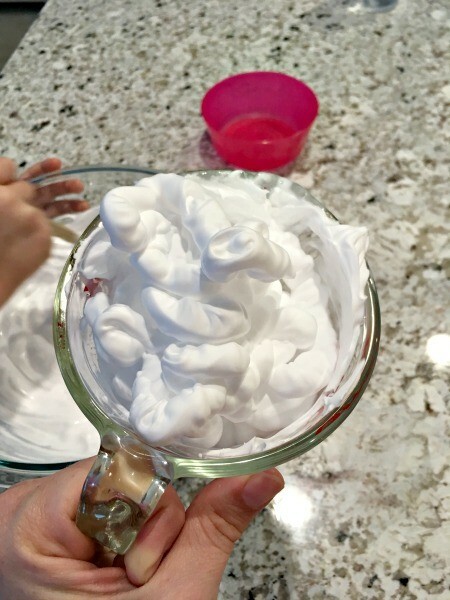 In a SEPARATE bowl, mix together 1 cup of Elmer’s glue, 1/2 cup of water, and 3.5 – 4 cups of shaving cream. Stir with a spatula until well combined. 3. Then stir in the contact solution to the white fluffy mixtures. 5. If you didn’t add the food coloring already, you can add it now. Just knead it into the fluffy slime until it is mixed together well. You will want to wear gloves or be prepared to have green fingers for a few days! After your kids play for HOURS! you will want to store the slime in an air tight container or a ziplock bag. It will last quite a while and give your days of entertainment. 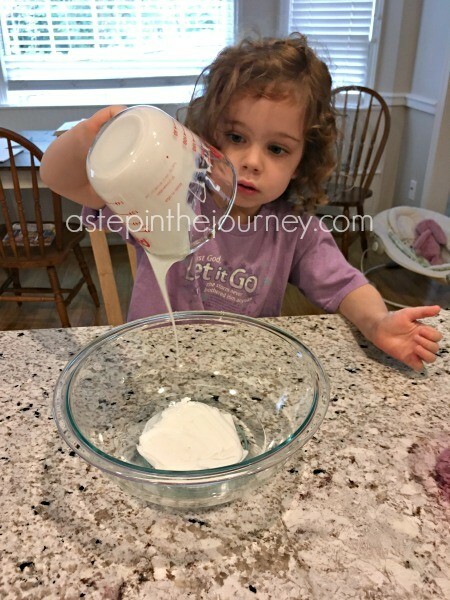 Click the recipe below if you would like to print the DIY Fluffy Slime directions for later crafting! Easy DIY Fluffy Slime that isn't sticky!! Make sure you wear gloves and word on a cutting board, bowl, or parchment paper if adding food coloring. 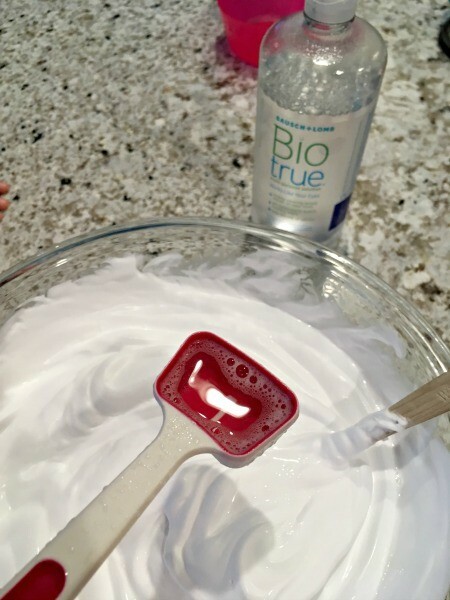 It will dye your hands and could stain your counters until it thoroughly mixed in! Then you should be good to go!